GPS Create: The earth is your canvas. GPS Create uses Global Positioning System (GPS) technology to explore fun and creative projects. Our bespoke GPS drawing software – GPS Sketch – fosters large-scale expression by tracking participants’ movement with a GPS device and creating a sketch of the result. The applications of GPS Create are diverse and include team-building events with a twist, festivals, and other events with a focus on interactivity. GPS Create offers a fun, immersive and unique experience to companies, schools, universities, sports organisations and more. GPS drawing is drawing on a very large scale. The earth is the canvas and you are the pencil. Satellites track your path as you move, creating virtual lines across the landscape. Our custom-built GPS Sketch software interprets these line drawings to create beautiful, poetic, composite animations which visualise time, rhythm, form and the intersection and non-intersection of people's paths. GPS drawing is an excellent way to foster collaboration and team-building through workshops or other events. We can develop workshops or activities based on your requirements. There is no minimum or maximum time-frame or limit to the number of participants. GPS Create is an initiative of Adam Hinshaw and Elisa Lee. 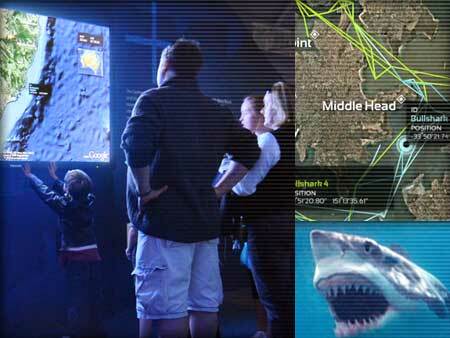 Data from Australian shark tracking research presented to the public through a blend of education and entertainment.